The tutorial and examples are designed for VE companies creating a business plan for a new business. Prepare a 7-week timeline to assure the business plan will be completed in time. 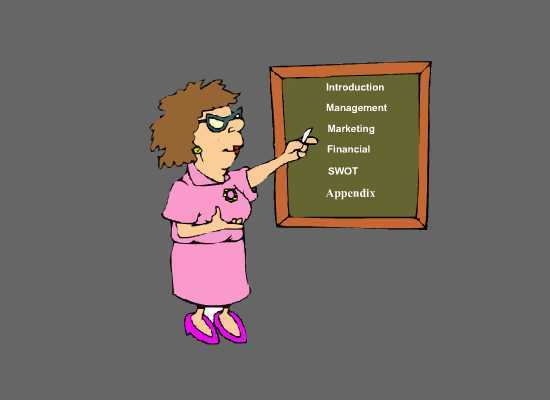 The lesson contains the rubrics needed to complete the business plan. Click on the part of the plan you want to view on the blackboard and the element will appear in the frame below. 2013-2014 National Operating Guidelines: Important changes in developing a business plan. FISCAL YEAR - a 12-month fiscal year is necessary for perpetual firms and in accounting for activity in May in June. It was agreed that we would maintain a 12-month fiscal year to accommodate activities associated with closing a fiscal year and the variance of start dates in school calendars. The fiscal year runs from may 1 through April 30. firms should be advised to make pre-payments for expenses incurred over the summer months, such as rent, utilities and loan payments. START-UP CAPITAL - The following scenario is meant to simplify the process of attaining start-up capital for new VE firms: The central office or business partner will provide :seed money" (an initial investment depending on certain parameters) in exchange for common stock. Firms would then use the that money to purchase their fixed assets from the open market or from the utility set up by VE through the wholesale marketplace andmight have some money left for initial operations. The stock will be valued at $10 per share and there would be a maximum investment amount to be determined using the discretion of the regional director Firms should not be given an amount that would negate the need to apply for a loan. LOAN APPLICATION - It is agreed that the loan amount should cover up to 5 months of projected operating expenses. INTEREST RATES - We are implementing an option of a variable or fixed rate loan for VE firms. The national fixed rate option will be prime + 2.00% and the variable rate option will be prime + 1.00%(adjusted each year). The prime rate should be based on the advertised rate in the Wall Street Journal as of September 1st of the current school year. All loans should have a repayment period of 5 years. SALARY- In order to implement a personal finance component nationally, we agree that firms should adopt a salary structure that will allow individual employees to meet the financial needs of a personal budget. We recommend that firms set salaries based on an entry-level position in the department in which they are working, commensurate with the average salaries for their geographic region. Furthermore, salaries would be based on a 40-hour work week. The minimum salary for a VE employee is $25,00/year and the maximum is $100,000/per year. BUSINESS CONTRACTS -It was agreed that we should allow firms to negotiate sales contracts with their regional offices in the amount of 75% of their projected salaries expense for each month. These contracts may also come in the form of contracts with a firm;s business partner. Contracts should be submitted to the VEI regional offices to be betted and deposited monthly into firm bank accounts. SALES TAX - We have agreed to standardize sale tax rate nationally at 7%. Sale tax should be assessed and collected on all applicable instate and inter-state transactions. Sale tax reporting and remittance to regional offices will be done monthly. TAX SUBMISSION FORMS - We have standardized the submission forms and included them on the reference files page of the website. BUSINESS PLAN - Submission of a business plan should be a required component of the program in all regions. Firms may choose not to compete in a business plan competition, but all firms should submit a written plan, which would factor into a firm's annual evaluation. Firms that are not logistically able to travel to a regional competition should be given every opportunity to present their plan for national competition consideration either via teleconferencing (Skype, Vidyo, go To Meeting, etc.) or appropriate means. E-COMMERCE WEBSITE- All firms should develop a website that highlights their products and/or services and has e-commerce capabilities. Firm websites will be evaluated using the Better Business framework and website competition rubrics. ANNUAL REPORT - All firms should prepare an annual report to summarize the year's activities. The contents of this report should be based on the annual report rubric that is included on the web site. Pass out the progress logs each week to ensure a timely plan completion. Look at the blackboard and then click on the part of the business plan you want to see. Lovebytes is the business plan example.